As many of you know I've been making changes in the dining room. The new hutch will be delivered tomorrow and the old hutch/china cabinet is still here and has to move. Mr. Savvy said I worked too hard on it to let it go. So where on earth is it going in our home? Well, I have a plan and am sharing some ideas of hutches or china cabinets used in other rooms and filled with things besides china. I love how my friend Courtney filled hers with books and textured objects. Love this elegant beauty used in a bedroom by Pam at Simple Details. A simple look by Painted and I want that large antler. This beauty is done in colors very similar to my curio cabinet that I recently made over. 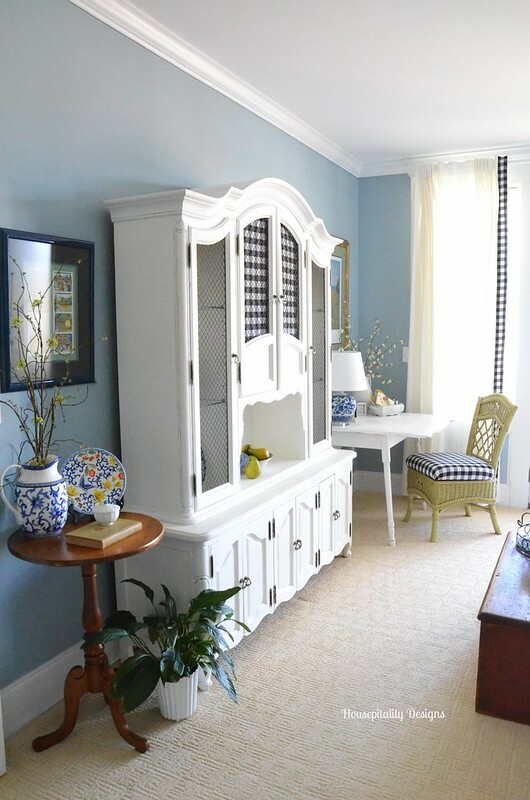 And I love this large painted hutch in the guest room by my bff Shirley at Housepitality Designs. So my china cabinet will be moved to a new room in the house soon since obviously they aren't just for dining rooms. Have you used one outside the dining room? Thanks for the shout out on my French Country Hutch in the guest room. Love all of the examples of using them in other places than the dining room. I am so happy that you will be keeping and relocating your hutch in the house. Can't wait to see the new one for your dining room!!! Happy Friday! Absolutely! We even converted the top of one with solid top doors into a wardrobe (not for dresses, but plenty long enough for most things). I love these ideas! My m-i-l is giving me a hutch that I really don't have room for. Seeing these pix makes me think I can probably use it in my family room. Yes I have one in my master bath, I use it to hold soaps,lotions and other toiletries . So glad you're keeping your beautiful original hutch! Knowing you, you'll find the perfect spot for it and have a blast re-purposing it! Love these images! 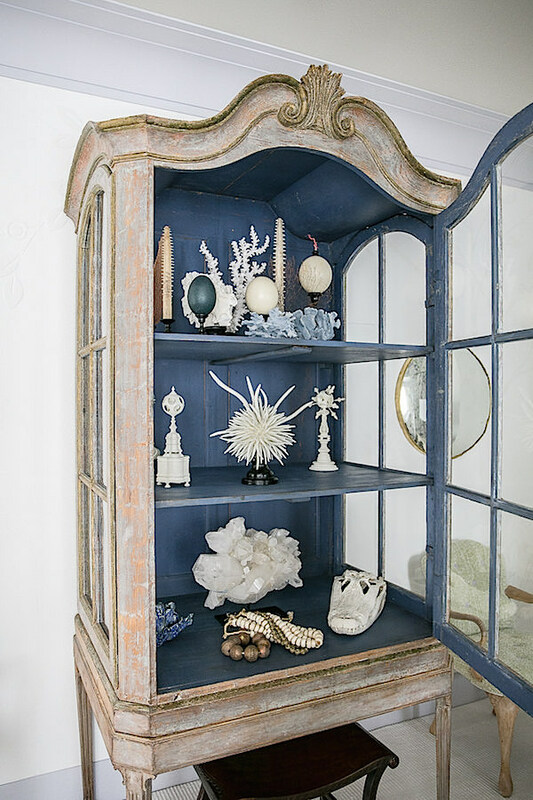 I just wrote a post yesterday regarding how I am currently turning my living room hutch into a springtime cabinet of curiosities. Hutches are so versatile. You made a great decision to keep the hutch and relocate it. Wherever you choose to place it will be beautiful! I love them for pretty storage. Can't wait to see your new hutch! I bought a Hoosier cabinet for my dining space and didn't know what to do with my small white french looking China cabinet so it moved to the iving room and I love it there! You shared some beautiful images and ideas! Yes, Mr. Savvy is right, you worked hard on your china cabinet so I'm sure you will find the perfect spot for it! Love Hoosier cabinets! We have a painted one in our kitchen and one the original oak finish in our sunroom (holds potting/garden supplies). 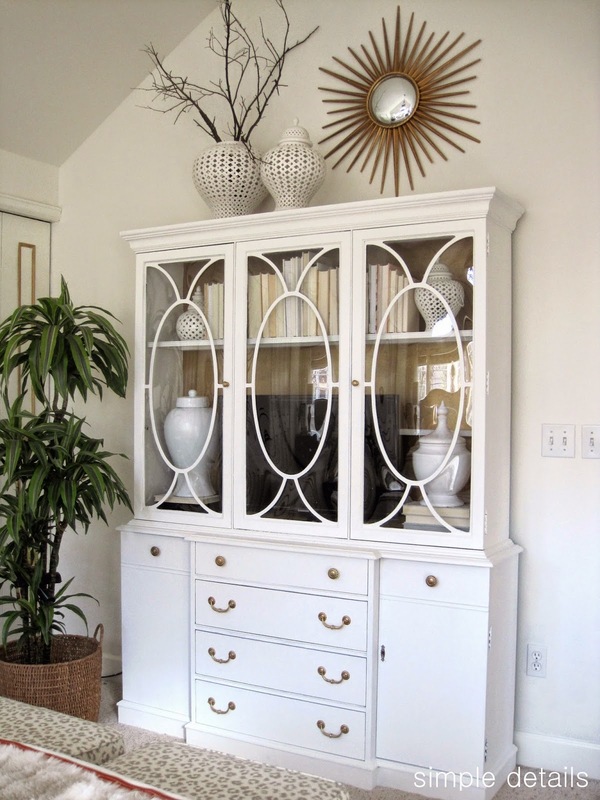 Love all ways to use china cabinets, looking forward to seeing how you used yours and seeing your new cabinet. Thanks for all the inspiration! IF we ever get a new hutch I now know I would like to put the present one in the guest room! I can't wait to see your new one, the whole dining room is going to look gorgeous! Have a great weekend!!! What a fun surprise to see my hutch pop up, thank you! Love yours, and can't wait to see where it ends up! I love these ideas! Yours will look great filled with things other than dishes in it's new spot. I use our old china cabinet as a book shelf in our great room and have a smaller one in the upstairs hall that I use as a linen cabinet. They were all such beautiful ideas for repurposing their hutches. I would love to have any of them in my home. So glad to hear you're keeping that beauty! Thank you soooooo much for appreciating hutches being located in parts of the home that are not dining rooms. I moved my large hutch to a living room wall after remodeling our living room/dining room and taking down a wall to our kitchen. We are now using the dining room as casual dining space with our beautiful country french table and we love it. The old floor plan required us to swag our chandelier about 18 inches toward the living room in order to accommodate the hutch. I wanted to have the table more centered with the patio door to enjoy the view of our gardens now that we have eliminated the heavy window treatments. So we now have the light centered. Had a designer over to our home about a year ago. I have known her for a long time and knew she would not like the change. We are looking for some new upholstered pieces. Sure enough she commented how it was now an elephant in the room:( Made me sad because I love it. I have had fun changing it out and figuring out what I want displayed...sometimes I wish it didn't have glass shelves. Still haven't figured out upholstery pieces...we use to have two full size sofas and two accent chairs. The "elephant" is now on the wall where one of the sofas were - it has made this vaulted ceiling room so much cozier. Sorry to ramble - just so excited to see what I have dreamed for a long time is genuinely accepted by not only you but your readers. Love all the pictures you shared. I love the idea to use a hutch to store all kind of things!